Check Out These Interviews, Articles, Profiles and more. I was born in Winston Salem, North Carolina. My father was born in Long Beach, California and decided to move when back to his hometown when I was nine months old. Long Beach was one of those towns that few people moved away from and most residents were happy to live out their lives there. We lived two blocks from the ocean near Bixby Park. I started skimboarding and surfing in the late 1950's. My first surfboard was a hollow square-railed paddleboard made out of plywood. We had to stand it on end when it would fill up with water and and allow the water to drain out. My next surfboard was a 10'4" Balsa wood Velzy/Jacobs. I went through a lot of surfboards as technology and design improved. Our neighborhood group of friends were all typical California kids and were involved with surfing, skimboarding and skateboarding. My brothers had metal roller skates which I cut in half and nailed to a 2x4 to make a homemade skateboard in 1958. 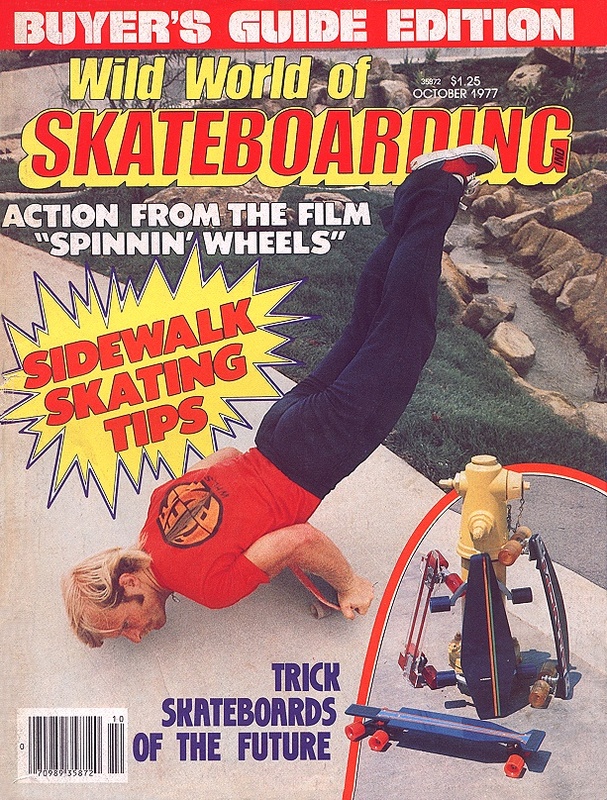 My parents noticed my interest in skateboarding and took me to SavOn Drug Store to buy a commercial skateboard. There were few choices at that time and I got a Roller Derby plywood deck with metal wheels for under $5. Our family was very poor and I was grateful for anything. My friends and I used our skateboards exclusivley for transportation around town. Although I was the last to learn any new trick, there was something special about skateboarding and it seemed to be more of a friend than an activity. Skateboarding was a very personal platform by which anyone could step up onto it and express how they felt. There were no rules, no one telling us how to skate and no preconceived limitations; we were free to ride how we wanted to - Freestyle. Junior High and Senior High years were also heavily centered upon surfing and skateboarding. The Vietnam War was going on at the time I graduated high school in 1967 and many of my friends and myself were drafted into service. Three of my friends were killed and others were scattered to different locations when they returned home. It was a time to redefine who I was and what I wanted to become. I decided to go to college and graduated with degrees in Mathematics, Physical Education and a Master's Degree in Computer Science. Skateboarding was still my preferred mode of transportation on campus and it soon became how others perceived me. The College Newspaper ran several articles on my skateboarding and views of how it should be recognized as a legitimate sport. The urethane wheel was introduced in 1974 and skateboard manufacturers were eager to promote the Sport of Skateboarding once again. Dyno Surfboards promoted a small skateboard contest at the Huntington Beach shopping mall and Corky Carroll announced the event. I had to make a decision during the Finals to either quit the contest and return to work, or finish the contest and risk losing my job. I was fired from my job later that evening - although this goes totally against my personality, it turned out to be one of the best decisions of my life. Fred Flavell won the Junior Freestyle event and I won the Senior Freestyle event. Skateboarding was about to derail my life in a wonderful way. Corky Carroll's humorous style of announcing was quickly adopted to my own style of announcing future skateboarding events. While attending California State University of Long Beach as a Physical Education major, I became involved in Community Parks and Recreation. I taught skateboarding to a group of youths at Bixby Park and the program grew rapidly. 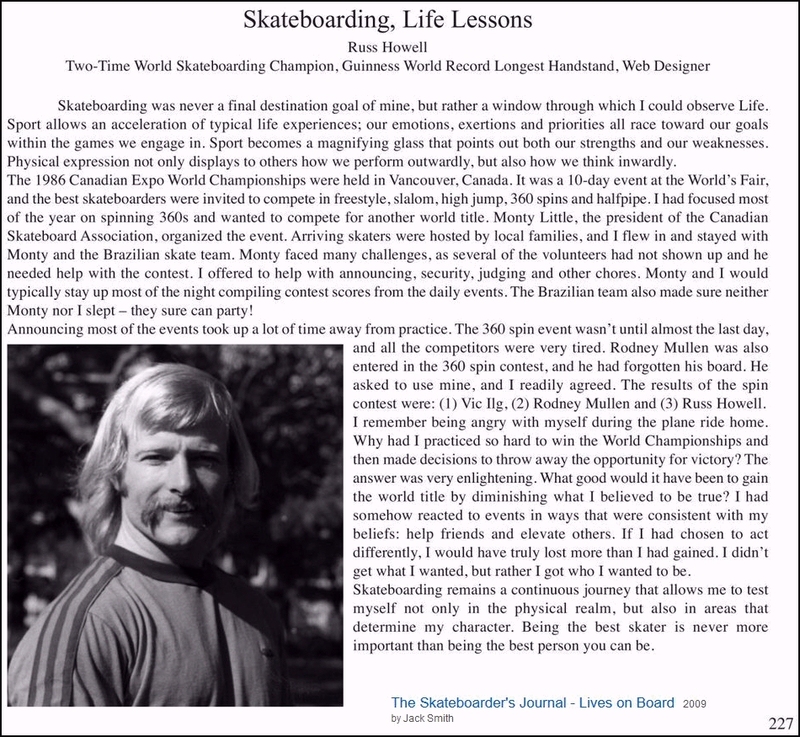 Sharing my passion for skateboarding with others established the foundation of my involvement with the Sport. Service to others and the sport would always come first before personal gain or recognition. 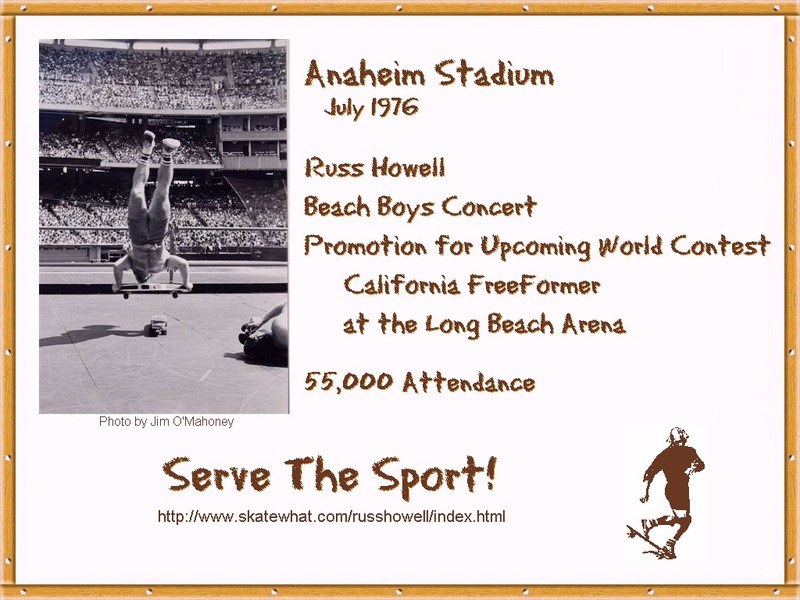 One of the students brought a flyer to class which advertised the 1975 Bahne/Cadillac United States National Skateboarding Championships. My students urged me to join and so I drove down to Del Mar, California and competed with 500 other skaters from across the nation. The weekend was filled with amazement, new friends, dreams and a new path in life. 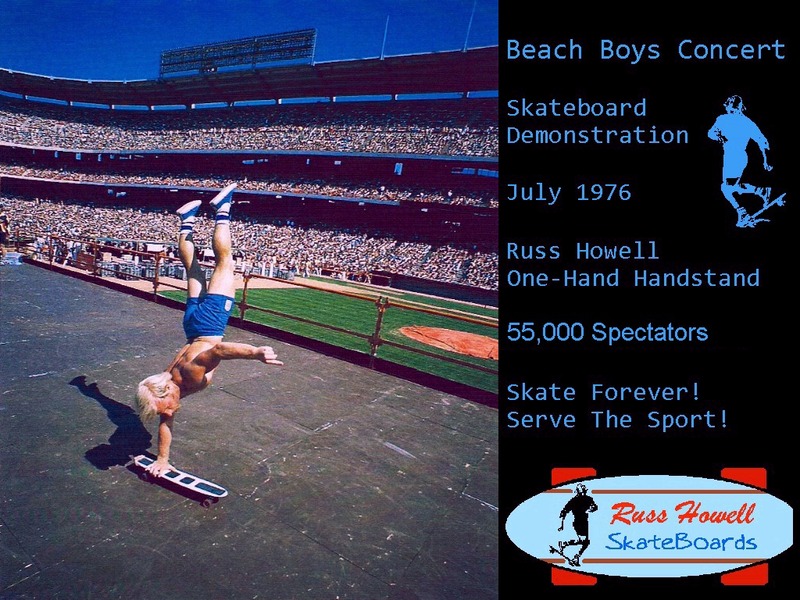 I won the 1975 United States Del Mar National Skateboarding Championships and my life was changed forever that weekend. 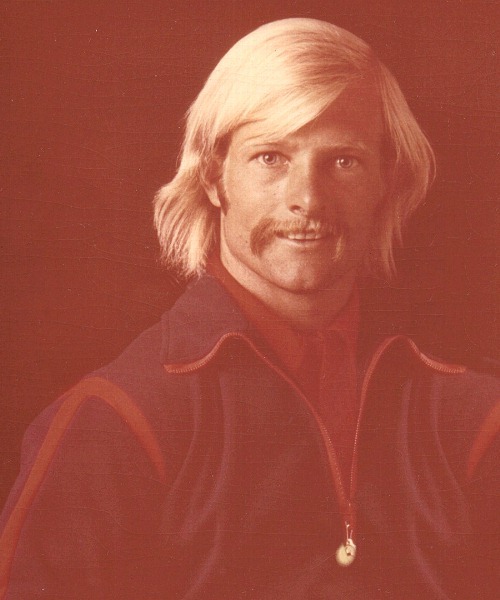 The National Title now allowed me to become a spokesman for the Sport and elevate it to what I had always believed it deserved. My Physical Education Degree became very useful in promoting Skateboarding as a genuine Sport. I appeared on "The Tonight Show", "Good Morning America", "To Tell The Truth", and various News stations around the world. 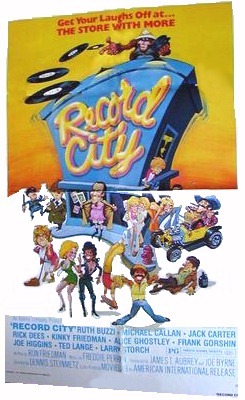 Appearances in Hollywood films helped to popularize Skateboarding further. I worked with Skateboard Associations such as USSA, WSA, CASL, NSA, and many others to formulate rules for competition. While working with Sally Anne Miller at ISA, we formed PRO (Professional Riders Organization) which helped other skaters gain paying jobs. I worked at Assistant Team Director for Vision, Sims, and Schmidt Stix with over 150 skaters to gain Skate Demos for the teams. 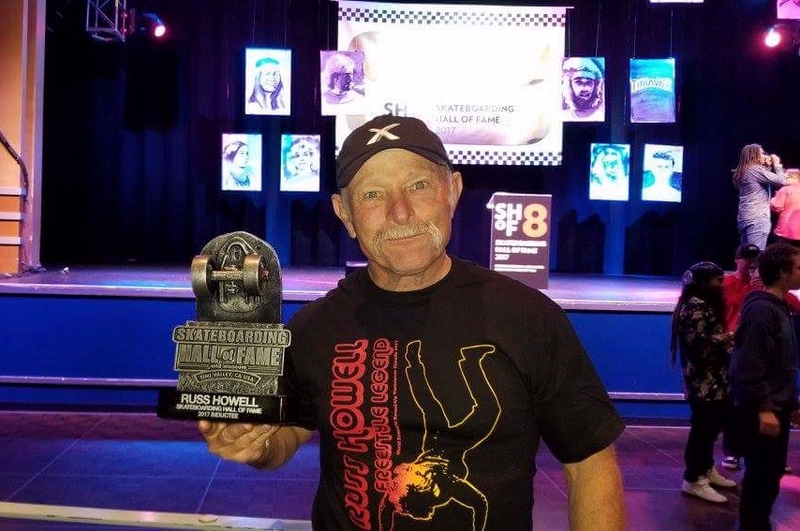 I have toured throughout the United States, Canada, Australia, Japan, England, Germany, Denmark, Belgium, France, and Peru to promote Skateboarding. My dream of integrating Skateboarding into public school systems came to fruition in parts of Australia and Germany. I was at the Grand Opening of the World's Oldest Existing Skateboard Park in Albany, Australia. The past six decades have been a magical journey filled with adventure, friends, and accomplishments. It's now 60 years later (1958-2018) and I still love Skateboarding! Surfing's Little Brother has grown up. Ed Nadalin skated in a film titled, "The Magic Rolling Board." What a great description of our Sport. As I look back on the years involved with skating, the greatest treasures are the friends encountered along the way. Although I never made any money from any product that bore my name, I am much richer for riding through Life on a skateboard. Skate Forever and Serve the Sport! 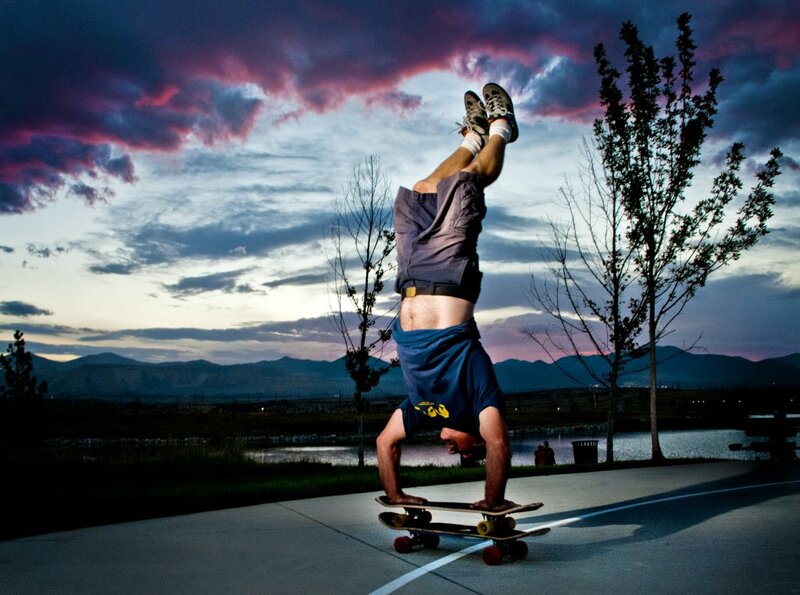 Skateboarding was never a final destination of mine, but rather a window through which I could observe Life. Sport allows an acceleration of typical life experiences; our emotions, exertions and priorities all race toward our goals within the games we engage in. Sport becomes a magnifying glass that points out both our strengths and our weaknesses. Physical expression not only displays to others how we perform outwardly, but also how we think inwardly. The 1986 Canadian Expo World Championships were held in Vancouver, Canada. It was a 10-day event at the World's Fair, and the best skateboarders were invited to compete in freestyle, slalom, high jump, 360 spins and halfpipe. I had focused most of the year on spinning 360s and wanted to compete for another world title. 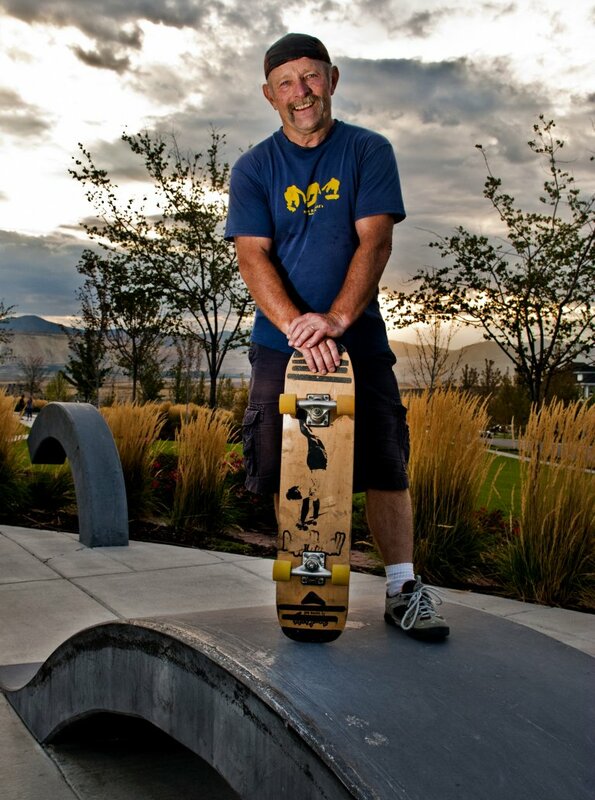 Monty Little, the president of the Canadian Skateboard Association, organized the event. Arriving skaters were hosted by local families, and I flew in and stayed with Monty and the Brazilian skate team. Monty faced many challenges, as several of the volunteers had not shown up and he needed help with the contest. I offered to help with announcing, security, judging and other chores. Monty and I would typically stay up most of the night compiling contest scores from the daily events. The Brazilian team also made sure neither Monty nor I slept - they sure can party! Announcing most of the events took up a lot of time away from practice. The 360 spin event wasn't until almost the last day, and all the competitors were very tired. Rodney Mullen was also entered in the 360 spin contest, and he had forgotten his board. He asked to use mine, and I readily agreed. 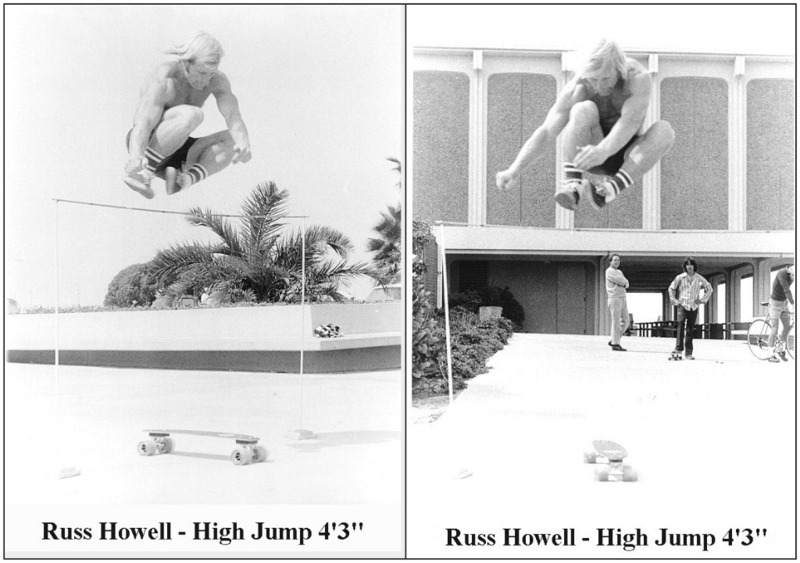 The resuls of the spin contest were: (1) Vic Ilg, (2) Rodney Mullen and (3) Russ Howell. I remember being angry with myself during the plane ride home. Why had I practiced so hard to win the World Championships and then made decisions to throw away the opportunity for victory? The answer was very enlightening. What good would it have been to gain the world title by diminishing what I believed to be true? I had somehow reacted to events in ways that were consistent with my beliefs: help friends and elevate others. If I had chosen to act differently, I would have truly lost more than I had gained. I didn't get what I wanted, but rather I got who I wanted to be. Skateboarding remains a continuous journey that allows me to test myself not only in the physical realm, but also in areas that determine my character. Being the best skater is never more important than being the best person you can be. 1st in Division - Member of winning team. 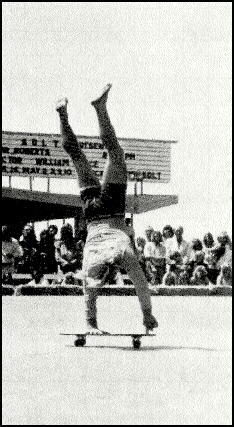 Guinness:  1977 - Longest Skateboard Handstand. 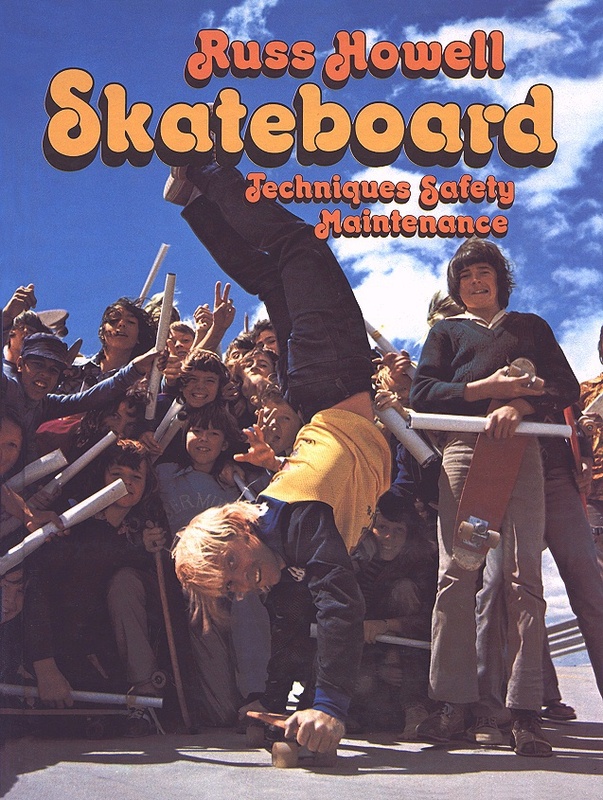 1975: "Handbook of Freestyle Skateboard Tricks"
1975: "Skateboard:  Techniques, Safety, & Maintenance"
Pepsi commercial shown in Australia only. Chrysler/Plymouth commercial shown in Mid-West only. for the Long Beach Computer User's Group. and the use of various Utilities. Development of training seminars on all systems. Consultant for school and teacher computer needs. Trained office staff for accounting/record keeping. as part of the requirements for my Master's Degree. Calvary Chapel of Downey School. BASIC Programming, Graphics Programming, and LOGO. Taught Grades 7-10 Math including Algebra and Geometry. Set up Budget Analysis Program for Administration. Also taught Math for grade 7.
on how to integrate computers into the classroom. their conversion from Apple to IBM. and White Pine Elementary Schools. HTML WebPage Design, CD Music Creation. Currently teaching these classes with Community Education.